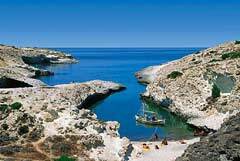 Kapros is a small beach on the northern side of the island, between Pahena and Alogomandra. The coast is very small and extends between two rocks. The water is clean and the surrounding nature has short vegetation. The beach is not organized and has no tourist facilities around.